This was just about the quickest trip ever – 6 days including air travel – that began with a cheap airfare to Chicago at the beginning of October and a Magritte exhibition at the Art Institute, where we spent a day, followed by a "what do we do now?" moment. Christine wanted to visit the legendary botanical garden in St. Louis, so we went there, stopping briefly en route in Springfield, Illinois to tour a Frank Lloyd Wright house. This part of the trip is recorded in the snapshots file, as is the last day in Sainte Genevieve, the pretty pre-USA French village on the Mississipi where we spent a night before dashing back to Chicago. 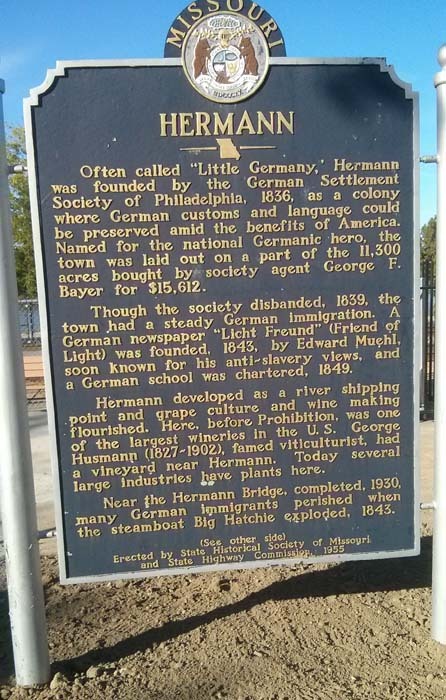 We thought initially we would stay in Saint Charles on the northern edge of St. Louis on the Missouri River, but found it too touristy, so we wandered upriver before arriving at Hermann near the end of the day. It was such a nice little town that we booked in for a second night and spent part of the next day driving west along the river to Jefferson City, then returned along the south bank. No time for artwork except at Hermann and nearby, which is below. As Henri Cartier-Bresson said, "photography is quick drawing." Click for the photos from the cellphone camera. A splendidly dilapidated, long-abandoned farmhouse in a copse of trees, an islet in the soybean sea, behind the Missouri River levee (the line of trees in the distance). This is on the south side of the river, maybe 20 miles west of Hermann. The flood plain extends back from the river across a half mile of fertile soil before ending at a hillside; on the north side of the river, there is a similar floodplain backed by a second levee protecting a railroad track and a handful of villages. Soybeans, corn, corn, soybeans ... all the way up the river from St. Louis. Above: Hermann's main street, protected from the river by a steep little hill, atop which sits the county courthouse. I sat on the steps below the courthouse to draw the picture above. Hermann has a classic small-town's main street with a few antique/junque shops, brew-pub-style restaurants and a combination butcher/ commisary producing German-style food and beer and the local wine. It's easy to walk around in the evening – we stayed at a B&B in a Victorian-era house a few blocks away. There's really not much of an economy here other than the tourist one; the town was gearing up for its Octoberfest, which draws customers from the St. Louis area an hour or two away. "Wings A-Blazin'" was the liveliest place in town; everyone was focused on the run-up to the World Series, as for a time there was a possibility of it being an all-Missouri final, with the St. Louis Cardinals playing the Kansas City Royals. As it turned out, neither team went all the way. Below: the other place in town, with vintage booths and a lot of polished old wood.